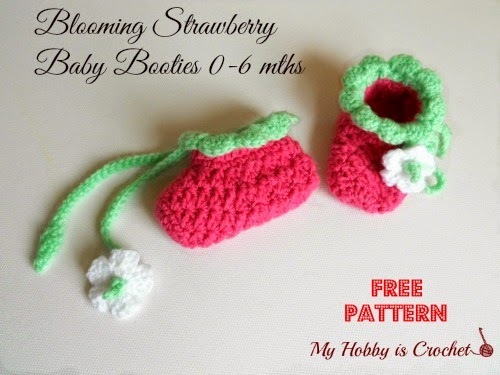 These cute crochet baby booties are part of the "Blooming Strawberry" Baby Set, among the Blooming Strawberry Earflap Hat. Work in rounds starting at the toe! Rounds 6 - 8: Repeat as round 5. Row 2: ch 1 (count as the first sc), work (1 hdc, 1 dc) into first st, * sk (1dc and 1 hdc), work (1 sc, 1 hdc, 1 dc) into next sc*, repeat from * to * 5 times total, sk last (1dc, 1 hdc), work 1 sc into 1 ch, turn. Rows 3 - 7: Repeat as row 2.
work (1 hdc, 1 dc) into same st as the decrease st, sk next (1 dc, 1 hdc), work (1 sc, 1 hdc, 1 dc) into next sc, sk next (1 dc, 1 hdc), 1 sc into 1ch. Turn. Row 9: ch 1 (count as the first sc), (1hdc, 1 dc) into same st, *sk next (1 dc, 1 hdc), work (1sc, 1 hdc, 1 dc) into next sc * x 4 times, sk next (1dc, 1 hdc), work 1 sc into 1ch. Turn the bootie inside out! Align the two sides and slip stitch across through both top loops of each side. Cut yarn. Fasten off! Turn the bootie on the right side. Cut yarn and fasten off invisibly. Round 4: ch 1, * work a shell of 5 dc into next ch1 space, sl st in between the next 2 dc sts *, repeat around. The Ties: Ch 85, sl st into 2nd ch from hook, 1 sc in next ch, 1 hdc in next ch, 1 dc in next ch, 1 hdc in next ch, 1 sc in next ch, 1 sl st in each remaining ch. Cut yarn. Fasten off. Weave in the ends. Magic ring. You will work all the petals directly into the magic ring. * Ch3, work dc2tog, ch 3, sl st into ring *, repeat from * to * 5 times for 5 petals. Cut yarn. Fasten off. Pull yarn end to close the magic ring. You should have a small hole in the center of the flower needed to insert the tie through it. With the help of the safety pin, insert the tie through the spaces around the foot opening of the booties; then insert the flower on the tie end and make a tight small knot. (This will be the flower center!) See the photo collage below! Stitch the flower secure in place! 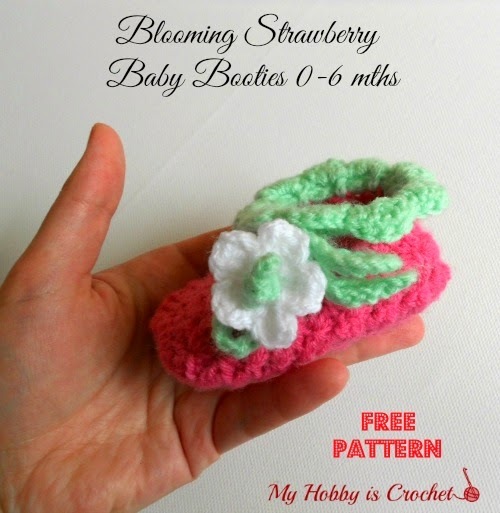 The matching Blooming Strawberry Baby Earflap Hat can be found HERE! 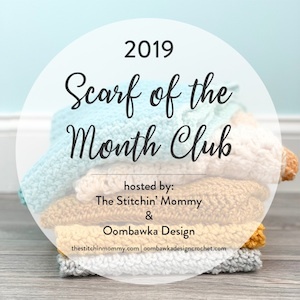 I hope you enjoyed this pattern! 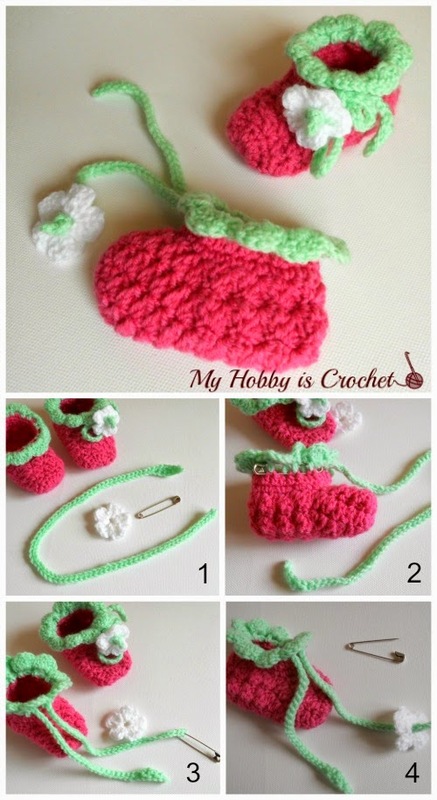 For more free crochet patterns and tutorials, please visit my FREE Crochet Pattern Page!